Talmudic authority; lived at Erfurt in the fourteenth and fifteenth centuries; a contemporary of Shalom of Neustadt, and a pupil of Meïr ben Baruch Faleri. According to A. Brüll, Hillel is identical with one "Hiller" who figures in a document of 1416 as having been nominated chief rabbi of Thuringia by Margrave Wilhelm (Ludewig, "Reliquiæ Manuscriptæ," x. 254). 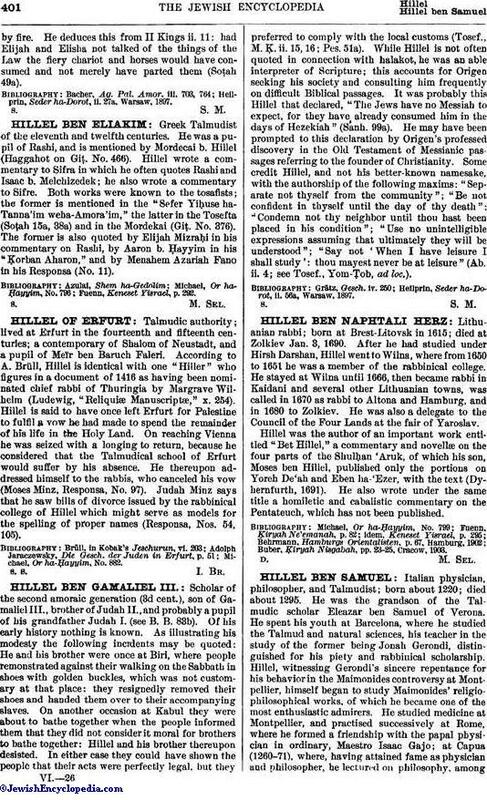 Hillel is said to have once left Erfurt for Palestine to fulfil a vow he had made to spend the remainder of his life in the Holy Land. On reaching Vienna he was seized with a longing to return, because he considered that the Talmudical school of Erfurt would suffer by his absence. He thereupon addressed himself to the rabbis, who canceled his vow (Moses Minz, Responsa, No. 97). Judah Minz says that he saw bills of divorce issued by the rabbinical college of Hillel which might serve as models for the spelling of proper names (Responsa, Nos. 54, 105). Michael, Or ha-Ḥayyim, No. 882.